Equipo Nizkor - Resolution reached between BSI SA and the US Department of Justice under the Swiss Bank Program. BSI SA ("BSI") submitted a Letter of Intent on December 24, 2013, to participate in Category 2 of the Department of Justice's Program for Non-Prosecution Agreements or Non-Target Letters for Swiss Banks, as announced on August 29, 2013 (hereafter "Swiss Bank Program"). This Non-Prosecution Agreement ("Agreement") is entered into based on the representations of BSI in its Letter of Intent and information provided by BSI pursuant to the terms of the Swiss Bank Program. The Swiss Bank Program is incorporated by reference herein in its entirety in this Agreement. |1| Any violation by BSI of the Swiss Bank Program will constitute a breach of this Agreement. On the understandings specified below, the Department of Justice will not prosecute BSI for any tax-related offenses under Titles 18 or 26, United States Code, or for any monetary transaction offenses under Title 31, United States Code, Sections 5314 and 5322, in connection with undeclared U.S. Related Accounts held by BSI during the Applicable Period (the "conduct"). BSI admits, accepts, and acknowledges responsibility for the conduct set forth in the Statement of Facts attached hereto as Exhibit A and agrees not to make any public statement contradicting the Statement of Facts. This Agreement does not provide any protection against prosecution for any offenses except as set forth above, and applies only to BSI and does not apply to any other entities or to any individuals. BSI expressly understands that the protections provided under this Agreement shall not apply to any acquirer or successor entity unless and until such acquirer or successor formally adopts and executes this Agreement. The terms of this Agreement shall continue to apply in full force to BSI and the Department of Justice following consummation of the pending acquisition of the share capital of BSI by Banco BTG Pactual S.A. and its subsidiaries. BSI enters into this Agreement pursuant to the authority granted by its Board of Directors in the form of a Board Resolution (a copy of which is attached hereto as Exhibit B). In recognition of the conduct described in this Agreement and in accordance with the terms of the Swiss Bank Program, BSI agrees to pay the sum of $211 million as a penalty to the Department of Justice ("the Department"). This shall be paid directly to the United States within seven (7) days of the execution of this Agreement pursuant to payment instructions provided to BSI. This payment is in lieu of restitution, forfeiture, or criminal fine against BSI for the conduct described in this Agreement. The Department will take no further action to collect any additional criminal penalty from BSI with respect to the conduct described in this Agreement, unless the Tax Division determines BSI has materially violated the terms of this Agreement or the Swiss Bank Program as described on pages 5-6 below. BSI acknowledges that this penalty payment is a final payment and no portion of the payment will be refunded or returned under any circumstance, including a determination by the Tax Division that BSI has violated any provision of this Agreement. BSI agrees that it shall not file any petitions for remission, restoration, or any other assertion of ownership or request for return relating to the penalty amount or the calculation thereof, or file any other action or motion, or make any request or claim whatsoever, seeking to collaterally attack the payment or calculation of the penalty. BSI agrees that it shall not assist any others in filing any such claims, petitions, actions, or motions. BSI further agrees that no portion of the penalty that BSI has agreed to pay to the Department under the terms of this Agreement will serve as a basis for BSI to claim, assert, or apply for, either directly or indirectly, any tax deduction, any tax credit, or any other offset against any U.S. federal, state, or local tax or taxable income. (d) BSI'S retention of a qualified independent examiner who has verified the information BSI disclosed pursuant to II.D.2 of the Swiss Bank Program. Under the terms of this Agreement, BSI shall: (a) commit no U.S. federal offenses; and (b) truthfully and completely disclose, and continue to disclose during the term of this Agreement, consistent with applicable law and regulations, all material information described in Part II.D.l of the Swiss Bank Program that is not protected by a valid claim of privilege or work product with respect to the activities of BSI, those of its parent company and its affiliates, and its officers, directors, employees, agents, consultants, and others, which information can be used for any purpose, except as otherwise limited in this Agreement. Notwithstanding the term of this Agreement, BSI shall also, subject to applicable laws or regulations: (a) cooperate fully with the Department, the Internal Revenue Service, and any other federal law enforcement agency designated by the Department regarding all matters related to the conduct described in this Agreement; (b) provide all necessary information and assist the United States with the drafting of treaty requests seeking account information of U.S. Related Accounts, whether open or closed, and collect and maintain all records that are potentially responsive to such treaty requests in order to facilitate a prompt response; (c) assist the Department or any designated federal law enforcement agency in any investigation, prosecution, or civil proceeding arising out of or related to the conduct covered by this Agreement by providing logistical and technical support for any meeting, interview, federal grand jury proceeding, or any federal trial or other federal court proceeding; (d) use its best efforts promptly to secure the attendance and truthful statements or testimony of any officer, director, employee, agent, or consultant of BSI at any meeting or interview or before a federal grand jury or at any federal trial or other federal court proceeding regarding matters arising out of or related to the conduct covered by this Agreement; (e) provide testimony of a competent witness as needed to enable the Department and any designated federal law enforcement agency to use the information and evidence obtained pursuant to BSI'S participation in the Swiss Bank Program; (f) provide the Department, upon request, consistent with applicable law and regulations, all information, documents, records, or other tangible evidence not protected by a valid claim of privilege or work product regarding matters arising out of or related to the conduct covered by this Agreement about which the Department or any designated federal law enforcement agency inquires, including the translation of significant documents at the expense of BSI; and (g) provide to any state law enforcement agency such assistance as may reasonably be requested in order to establish the basis for admission into evidence of documents already in the possession of such state law enforcement agency in connection with any state civil or criminal tax proceedings brought by such state law enforcement agency against an individual arising out of or related to the conduct described in this Agreement. 1. The Tax Division has agreed to specific dollar threshold limitations for the initial production of transaction information pursuant to Part II.D.2.b.vi of the Swiss Bank Program, and set forth in subparagraph (c) on pages 2-3 of this Agreement. BSI agrees that, to the extent it has not provided complete transaction information, it will promptly provide the entirety of the transaction information upon request of the Tax Division. 2. BSI agrees to close as soon as practicable, and in no event later than two years from the date of this Agreement, any and all accounts of recalcitrant account holders, as defined in Section 1471(d)(6) of the Internal Revenue Code; has implemented, or will implement, procedures to prevent its employees from assisting recalcitrant account holders to engage in acts of further concealment in connection with closing any account or transferring any funds; and will not open any U.S. Related Accounts except on conditions that ensure that the account will be declared to the United States and will be subject to disclosure by BSI. 3. BSI agrees to use best efforts to close as soon as practicable, and in no event later than the four-year term of this Agreement, any and all U.S. Related Accounts classified as "dormant" in accordance with applicable laws, regulations and guidelines, and will provide periodic reporting upon request of the Tax Division if unable to close any dormant accounts within that time period. BSI will only provide banking or securities services in connection with any such "dormant" account to the extent that such services are required pursuant to applicable laws, regulations and guidelines. If at any point contact with the account holder(s) (or other person(s) with authority over the account) is re-established, BSI will promptly proceed to follow the procedures described above in paragraph 2. 4. BSI agrees to retain all records relating to its U.S. cross-border business, including records relating to all U.S. Related Accounts closed during the Applicable Period, for a period of ten (10) years from the termination date of the this Agreement. BSI'S obligations under this Agreement shall continue for a period of four (4) years from the date this Agreement is fully executed. BSI, however, shall cooperate fully with the Department in any and all matters relating to the conduct described in this Agreement, until the date on which all civil or criminal examinations, investigations, or proceedings, including all appeals, are concluded, whether those examinations, investigations, or proceedings are concluded within the four-year term of this Agreement. It is understood that if the Tax Division determines, in its sole discretion, that: (a) BSI committed any U.S. federal offenses during the term of this Agreement; (b) BSI or any of its representatives have given materially false, incomplete, or misleading testimony or information; (c) the misconduct extended beyond that described in the Statement of Facts or disclosed to the Tax Division pursuant to Part II.D.1 of the Swiss Bank Program; or (d) BSI has otherwise materially violated any provision of this Agreement or the terms of the Swiss Bank Program, then (i) BSI shall thereafter be subject to prosecution and any applicable penalty, including restitution, forfeiture, or criminal fine, for any federal offense of which the Department has knowledge, including perjury and obstruction of justice; (ii) all statements made by BSI'S representatives to the Tax Division or other designated law enforcement agents, including but not limited to the appended Statement of Facts, any testimony given by BSI'S representatives before a grand jury or other tribunal whether prior to or subsequent to the signing of this Agreement, and any leads therefrom, and any documents provided to the Department, the Internal Revenue Service, or designated law enforcement authority by BSI shall be admissible in evidence in any criminal proceeding brought against BSI and relied upon as evidence to support any penalty on BSI; and (iii) BSI shall assert no claim under the United States Constitution, any statute, Rule 410 of the Federal Rules of Evidence, or any other federal rule that such statements or documents or any leads therefrom should be suppressed. Determination of whether BSI has breached this Agreement and whether to pursue prosecution of BSI shall be in the Tax Division's sole discretion. The decision whether conduct or statements of any current director, officer or employee, or any person acting on behalf of, or at the direction of, BSI, will be imputed to BSI for the purpose of determining whether BSI has materially violated any provision of this Agreement shall be in the sole discretion of the Tax Division. In the event that the Tax Division determines that BSI has breached this Agreement, the Tax Division agrees to provide BSI with written notice of such breach prior to instituting any prosecution resulting from such breach. Within thirty (30) days of receipt of such notice, BSI may respond to the Tax Division in writing to explain the nature and circumstances of such breach, as well as the actions that BSI has taken to address and remediate the situation, which explanation the Tax Division shall consider in determining whether to pursue prosecution of BSI. 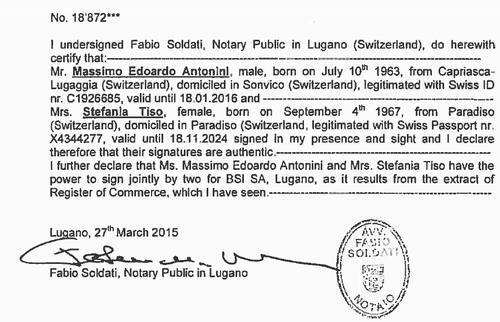 In addition, any prosecution for any offense referred to on page 1 of this Agreement that is not time-barred by the applicable statute of limitations on the date of the announcement of the Swiss Bank Program (August 29, 2013) may be commenced against BSI, notwithstanding the expiration of the statute of limitations between such date and the commencement of such prosecution. For any such prosecutions, BSI waives any defenses premised upon the expiration of the statute of limitations, as well as any constitutional, statutory, or other claim concerning pre-indictment delay and agrees that such waiver is knowing, voluntary, and in express reliance upon the advice of BSI's counsel. It is understood that the terms of this Agreement, do not bind any other federal, state, or local prosecuting authorities other than the Department. If requested by BSI, the Tax Division will, however, bring the cooperation of BSI to the attention of such other prosecuting offices or regulatory agencies. It is further understood that this Agreement and the Statement of Facts attached hereto may be disclosed to the public by the Department and BSI consistent with Part V.B of the Swiss Bank Program. This Agreement supersedes alt prior understandings, promises and/or conditions between the Department and BSI. No additional promises, agreements, and conditions have been entered into other than those set forth in this Agreement and none will be entered into unless in writing and signed by both parties. 1. BSI SA ("BSI" or "the bank") was established in Lugano, Switzerland in 1873 and is a corporation organized under the laws of Switzerland. It operates a global financial services business in more than 13 countries with over 2,000 full-time employees. It offers private banking and wealth management services for over 125,000 client accounts, focusing on high-net-worth individual clients around the globe, including U.S. citizens, legal permanent residents, and resident aliens. 2. In 2013, BSI held Assets under Management ("AuM") totaling approximately $98.2 billion, $63.6 billion of which were managed in Switzerland. This made BSI the ninth largest private banking and wealth management bank in Switzerland based on AuM. 3. Unless otherwise specifically noted herein, BSI and its Switzerland-based subsidiaries and affiliates will be collectively referred to as BSI. 4. U.S. citizens, resident aliens, and legal permanent residents have an obligation to report all income earned from foreign bank accounts on their tax returns and to pay the taxes due on that income. Since tax year 1976, U.S. citizens, resident aliens, and legal permanent residents have had an obligation to report to the Internal Revenue Service ("IRS") on the Schedule B of a U.S. Individual Income Tax Return, Form 1040, whether that individual had a financial interest in, or signature authority over, a financial account in a foreign country in a particular year by checking "Yes" or "No" in the appropriate box and identifying the country where the account was maintained. 5. Since 1970, U.S. citizens, resident aliens, and legal permanent residents who have had a financial interest in, or signature authority over, one or more financial accounts in a foreign country with an aggregate value of more than $10,000 at any time during a particular year were required to file with the Department of the Treasury a Report of Foreign Bank and Financial Accounts, FinCEN Form 114, formerly known as Form TDF 90-22.1 (the "FBAR"). 7. Since approximately the 1930s, Switzerland has maintained laws that ensure the secrecy of client relationships at Swiss banks. Swiss law prohibits the disclosure of identifying information without client authorization, especially to foreign government investigators. These are Swiss criminal laws punished by imprisonment. Because of the secrecy guarantee that they created, these Swiss criminal provisions enabled U.S. clients to conceal their Swiss bank accounts from U.S. authorities. 8. In or about 2008, Swiss bank UBS AG ("UBS") publicly announced that it was the target of a criminal investigation by the Internal Revenue Service and the United States Department of Justice and that it would be exiting and no longer accepting certain U.S. clients. On February 18,2009, the Department of Justice and UBS filed a deferred prosecution agreement in the Southern District of Florida in which UBS admitted that its cross-border banking business used Swiss privacy law to aid and assist U.S. clients in opening and maintaining undeclared assets and income from the IRS. Since UBS, several other Swiss banks have publicly announced that they were or are the targets of similar criminal investigations and that they would likewise be exiting and not accepting certain U.S. clients (UBS and the other targeted Swiss banks are collectively referred to as "Category 1 banks"). These cases have been closely monitored by banks operating in Switzerland including BSI since at least August of 2008.
structuring transfers of funds from the undeclared accounts to evade currency transaction reporting requirements. 10. BSI opened, serviced, and profited from accounts for U.S. clients with the knowledge that many were likely not complying with these obligations. Due in part to the assistance of BSI and its personnel, and with the knowledge that Swiss banking secrecy laws would prevent BSI from disclosing their identities to the IRS, thousands of U.S. clients of BSI filed false and fraudulent U.S. Individual Income Tax Returns, Forms 1040, which failed to report their respective interests in their undeclared accounts and the related income. Thousands of U.S. clients of BSI also failed to file and otherwise report their undeclared accounts on FBARs. 11. BSI has held and managed approximately 3,500 U.S. client accounts, which included both declared and undeclared accounts, with a peak AuM of $2.78 billion since August of 2008. It acquired approximately 2,164 of these accounts from its acquisitions of Lugano-based Banca Unione di Credito and Lugano-based Banca del Gottardo in 2006 and 2008 respectively. The remaining accounts were opened directly by BSI. 12. Private bankers (referred to as "Relationship Managers" or "RMs") served as the primary contact for U.S. clients with undeclared accounts at BSI. RMs in the U.S. cross-border business actively assisted or otherwise facilitated thousands of U.S. individual taxpayers in establishing and maintaining undeclared accounts in a manner designed to conceal the U.S. taxpayers' ownership or beneficial interest in said accounts. RMs were responsible for opening and managing client accounts at BSI but, after January of 2009, the bank also required new U.S. client accounts to be approved by senior management to ensure compliance with its U.S. client policies. The bank acquired these U.S. accounts predominantly from direct referrals, walk-ins, and business arrangements with external asset managers ("EAMs"). BSI compensated RMs, in part, based on the amount of business they generated for the bank. Approximately 265 RMs were responsible for managing at least one U.S. client account as of year-end 2008. 13. Approximately 198 EAMs were responsible for independently managing at least one U.S. client account held at BSI since August of2008. BSI compensated these EAMs for the business they generated for the bank based on a negotiated fee structure. In the wake of the UBS investigation, certain EAMs searched for Swiss banks that would accept inflows from other banks forced to exit their undeclared U.S. client account population. During 2008 and most of 2009, BSI accepted this EAM business. Thereafter, BSI accepted this business in limited circumstances. 14. BSI maintained undeclared accounts for U.S. clients in different units throughout the bank. However, it primarily serviced U.S. client accounts at its: (a) International desk in Zurich (referred to internally as the North America or U.S. desk, based on the disproportionately large amount of U.S. clients it serviced) which focused on non-European clients; (b) two Latin America desks in Zurich and Geneva which focused on clients from Central and South America; (c) EAM desks in Lugano, Geneva, and Zurich which managed client accounts serviced by EAMs; (d) and 22 other private banking desks in Geneva, Lugano, and the greater Ticino area. Prior to 2011, when BSI centralized U.S. clients as part of its exit from the U.S. business, these five desks managed approximately 80 percent of BSI's U.S. client accounts. 15. BSI offered a variety of traditional Swiss banking services which it knew could and did assist U.S. clients in the concealment of assets and income from the IRS. One such service was hold mail. For a quarterly fee, BSI would hold all mail correspondence for a particular client at the bank. Approximately two-thirds of its U.S. clients used hold mail services. BSI also offered code name or numbered account services. For a quarterly fee, the bank would allow the accountholder to replace his or her identity with a code name or number on bank statements and other documentation sent to the client. However, BSI's internal records reflected the identity of the U.S. clients associated with these accounts, in compliance with Swiss law. More than one-third of BSI's U.S. clients used this service. 16. RMs typically communicated via telephone, fax, business email, and mail (when hold mail services were declined by the client) with certain of their clients in the United States. However, certain RMs occasionally communicated via personal email for reasons that included the concealment of client nexuses to the United States. Prior to December of 2008, several RMs from the Latin American desk, International desk, and Geneva and Lugano private banking desks traveled to the United States approximately one to two times per year. The purpose of these visits was to maintain existing relationships with U.S. clients, including by discussing their accounts, providing account records otherwise subject to hold mail restrictions, and updating client information. In July of2008, BSI adopted restrictions regarding business travel to the United States for members of management and RMs with more than ten U.S. taxpayer clients. However, since that time, BSI has also held numerous U.S. client accounts managed by EAMs, including EAMs formerly employed by Category 1 banks. 17. In mid to late 2008, in the wake of the UBS investigation, BSI began to assess the risks of its own U.S. cross-border business. During late 2008 and 2009, it issued a series of policies that had the practical effect of: (a) eliminating undeclared U.S. client accounts that were not financially worth the risk; (b) cutting off the paper trail back to the United States for accounts not reportable by the bank to the IRS; and (c) insulating the bank's exposure for undeclared U.S. client accounts behind its contractual relationships with EAMs in spite of, in some cases, their connections to Category 1 banks. Although these policies did remediate some of its undeclared U.S. client accounts, they also allowed BSI RMs to continue to open and maintain many highly profitable undeclared U.S. client accounts. Nonetheless, starting in 2010, BSI issued a series of effective and gradually restrictive policies that resulted in it exiting most of its undeclared U.S. client accounts by the end of 2012. In December of 2013, BSI voluntarily entered the United States Department of Justice's Program for Non-Prosecution Agreements or Non-Targets Letters for Swiss Banks (referred to as "Swiss Bank Program" or "SBP") as a Category 2 bank. 18. In limited instances, BSI provided services to its U.S. clients whereby it structured a U.S. related account so that it appeared as if it was held by a non-U.S. legal structure, such as an offshore corporation or trust, which aided and abetted the clients' ability to conceal their undeclared accounts from the IRS, Approximately 12% of BSI's U.S. client accounts after August 2008 were held in the name of offshore structures. 19. In the majority of cases, BSI RMs coordinated with external trust companies to create and administer offshore structures incorporated or based in offshore locations such as the British Virgin Islands, Panama, and Liechtenstein for its U.S. clients. Because Swiss law requires BSI to identify the true beneficial owner of structures on a document called a Form A, it knew that these were U.S. client accounts. Nonetheless, for certain U.S. client accounts, BSI RMs and other employees knowingly accepted and included in BSI's account records IRS Forms W-8BEN (or BSI's substitute forms) provided by the directors of the offshore companies that falsely represented under penalty of perjury that such companies were the beneficial owners, for U.S. federal income tax purposes, of the assets in the BSI accounts. This aided and assisted the U.S. clients in concealing these assets and income from the IRS. 20. Since 2008, BSI has also operated its own various trust companies in locations including the Bahamas, Channel Islands, and Malta. In a limited number of instances, BSI's trust companies established and administered offshore structures for BSI's U.S. clients. The structures it created included but were not limited to foundations, trusts, and companies incorporated or based in offshore locations such as the Bahamas, British Virgin Islands, Channel Islands, Panama, and Liechtenstein. By operation of Swiss bank secrecy laws, the U.S. client's ownership would not be disclosed to U.S. authorities. Moreover, because BSI owned and controlled these subsidiary trust companies, a U.S. client with an undeclared account at BSI in Switzerland knew that he or she would retain ultimate control over the assets in the undeclared account. 21. BSI RMs from the Zurich, Lugano, and Lausanne private banking and EAM desks aided and assisted nine U.S. clients with undeclared accounts at BSI by placing and maintaining their assets in accounts held in the names of insurance companies and not the actual beneficial owner of the funds (known colloquially as an "insurance wrapper"). Insurance wrappers were marketed to Swiss banks, including to BSI, by third-party providers in the wake of the UBS investigation as a means of disguising the beneficial ownership of U.S. clients. These particular accounts were all held in the name of subsidiaries of two insurance providers. By the operation of Swiss bank secrecy laws, the U.S. client's ownership would not be disclosed to U.S. authorities, including the IRS. 22. Effective in or about January 2001, BSI entered into a Qualified Intermediary ("QI") Agreement with the IRS. The QI regime provided a comprehensive framework for U.S. information reporting and tax withholding by a non-U.S. financial institution regarding U.S. securities. The QI Agreement was designed to help ensure that non-U.S. persons were subject to the proper U.S. withholding tax rates and that U.S. persons were properly paying U.S. tax, in each case, with respect to U.S. securities held in an account with the QI. The QI Agreement expressly recognized that a non-U.S. financial institution such as BSI may be prohibited by foreign law, such as Swiss law, from disclosing an account holder's name or other identifying information. In general, a QI subject to such foreign-law restrictions must request that its U.S. clients either (a) grant the Ql authority to disclose the client's identity or disclose himself by mandating the QI to provide an IRS Form W-9 completed by the account holder, or (b) grant the QI authority to sell all U.S. securities of the account holder (in the case of accounts opened before January 1, 2001) or to exclude all U.S. securities from the account (in the case of accounts opened on or after January 1, 2001). Following the effective date of the QI Agreement, a sale of U.S. securities, if any, held by a U.S. person who chose not to provide a QI with an IRS Form W-9 was subject to tax information reporting on an anonymous basis and backup withholding. 23. As a consequence of BSI entering into a QI Agreement with the IRS, certain RMs and supervisory RMs encouraged and allowed U.S. clients to create and open accounts in the name of sham offshore entities and insurance wrappers. In connection with these accounts, BSI employees knowingly accepted and included in BSI's account records IRS Forms W-8BEN (or BSI's substitute forms) provided by the directors of the offshore companies that falsely represented under penalty of perjury that such companies were the beneficial owners, for U.S. federal income tax purposes, of the assets in the accounts. 24. Certain RMs and others assisted U.S. clients in executing forms that directed BSI not to acquire U.S. securities in their accounts. The purpose of such forms was to avoid BSI having to disclose the identities of U.S. clients to the IRS under its QI Agreement. 25. Certain RMs, supervisory RMs, and others caused BSI to certify compliance with the QI Agreement even though the true beneficial owners were not reflected in the IRS Forms W-8BEN in the account files. 26. Certain RMs assisted U.S. clients in repatriating offshore funds by providing two types of pre-paid debit cards linked to their undeclared accounts, including one type of card issued by an American credit card company. Prior to 2009, the bank issued travel cash cards, including for at least 32 U.S. client accounts. These cards, which were issued without the U.S. client's name on the card, allowed clients to withdraw funds remotely or pay for goods and services without a paper trail back to their undeclared accounts in Switzerland. However, the internal records for BSI and the issuer reflected the identity of the U.S. clients associated with these accounts, in compliance with Swiss law. U.S. clients were permitted to transfer money from their accounts to their travel cards up to a maximum of $10,000 per load, $30,000 per month, and $100,000 per year by making a request to their RM via telephone, fax, or email. In a few instances, U.S. clients used secret code phrases in their communications with BSI RMs to disguise load requests such as "gas tank still running on empty" and "could you download some tunes for us?" In 2009, BSI began offering a second type of debit card that worked in a similar manner but had higher maximum re-load amounts, were accepted by more merchants, and offered online account access. BSI's legal and compliance department advised against providing U.S. clients with this second type of debit card because they were issued by an American company. Nonetheless, at least 11 U.S. client accounts were issued these cards. 27. Certain RMs assisted U.S. clients in repatriating money from their undeclared accounts back to the United States through nominee non-U.S. bank accounts. In at least three cases, the RMs directed the transfer of money from the undeclared accounts of certain U.S. clients to the accounts of non-U.S. individuals and, from there, to the U.S. clients in the United States. This aided the U.S. clients in disguising the nature and ownership of the money being transferred from Switzerland into the United States and, in turn, assisted them in concealing the assets and income they held at BSI in Switzerland from the IRS. 28. For at least 150 U.S. client accounts, certain RMs and others assisted U.S. clients in structuring withdrawals from their undeclared accounts in amounts less than $10,000 in an attempt to conceal the transactions from U.S. authorities. For at least 15 U.S. client accounts, the RMs directed such structured withdrawals based on standing instructions from clients to make regular transfers to the United States in amounts of less than $10,000. This conduct aided and assisted U.S. clients in avoiding United States currency transaction reporting requirements. 29. Certain RMs met with U.S. clients outside of the United States to provide banking services and investment advice related to their undeclared accounts. 30. Certain RMs assigned to desks including BSI's Zurich Central and Eastern European Desk opened and maintained U.S. client accounts as non-U.S. client accounts in spite of obvious evidence and indications that the client was actually a U.S. person. 31. Prior to August of 2008, BSI's senior management did not institute written or other formal policies concerning U.S. client accounts. However, in the wake of the Department of Justice's criminal investigation into UBS's U.S. cross-border business, BSI began to assess the risks of its own U.S. cross-border business. In 2008 and 2009, the bank issued a series of policies that, although restrictive on their face, allowed the continued opening and maintenance certain U.S. client accounts. Eventually, in 2010 and 2011, BSI implemented wholly restrictive policies with respect to its U.S. cross-border business. With few exceptions, BSI had successfully exited most of its undeclared U.S. client accounts by the end of 2012 and prohibited the acceptance of new U.S. client accounts in February of 2012. 32. In December of 2008, BSI issued a policy prohibiting the opening of accounts with offshore structures. It also prohibited the opening of non-Form W-9 accounts unless the account: (1) had a balance over CHF 300,000; (2) was managed by an EAM; or (3) did not trade in U.S. securities. Additionally, at that time, BSI mandated the closure of: (a) existing non-Form W-9 U.S. client accounts with balances under CHF 150,000; and (b) accounts with structures if those structures were managed by the bank rather than third-party providers. These policies nonetheless permitted RMs to: (a) open and maintain highly profitable, undeclared U.S client accounts without structures; (b) open and maintain undeclared accounts without structures regardless of dollar amount so long as it was serviced by an EAM; and (c) maintain existing accounts with structures so long as the structure did not hold U.S. securities and was not administered by BSI or its affiliated trust companies. 33. Also in December of 2008, BSI issued a policy statement strongly encouraging U.S. clients with small amounts of reportable income (under $ 10,000) to declare it to the IRS. However, in that same policy statement, the bank offered a neutral opinion as to whether larger (over $10,000 in income) U.S. accountholders should do the same. Moreover, the bank issued a policy statement mandating hold mail services for U.S. client accounts without Forms W-9 on file. 34. In May of 2009, managers on BSI's EAM desk issued a directive: (1) requiring EAMs to present new U.S. clients to his or her respective BSI RM; and (2) prohibiting finder fees for new U.S. clients. These directives did not restrict the ability of EAMs to earn other types of retrocession fees for business generated by the U.S. client account once at the bank. 35. Taken as a whole, the policies which BSI implemented in 2008 and 2009 had the practical effect of: (a) eliminating non-EAM managed undeclared U.S. client accounts that were not financially worth the risk; (b) cutting off the paper trail back to the United States for undeclared U.S. client accounts; and (c) insulating the bank's exposure for undeclared U.S. client accounts behind its contractual relationships with EAMs. The latter was particularly problematic given that six of BSI's top ten EAMs in terms of number of accounts and AuM: (a) were managed by former employees of Category 1 banks; (b) primarily serviced U.S. client accounts transferred from Category 1 banks; and/or (c) employed individuals who had been indicted in the United States for aiding and assisting U.S. clients in concealing offshore assets and income from the IRS. These policies were generally followed by bank employees but exceptions were made for extremely high-net-worth clients and clients managed by certain EAMs. 36. Beginning in late 2010, BSI implemented increasingly restrictive and effective measures concerning its U.S. cross-border business. In November of 2010, BSI adopted a policy prohibiting the acceptance of any new accounts for U.S. taxpayers without a Form W-9. Three months later, in January of 2011, BSI adopted a policy requiring the closure of existing U.S. client accounts that failed to provide a Form W-9 or evidence of participation in an IRS Offshore Voluntary Disclosure Program by the end of 2012. Then, in September 2011, BSI issued oral instructions prohibiting travel to the United States. Finally, in February 2012, BSI prohibited the opening of any new U.S. client account. 37. On or about August 5, 2013, BSI approached U.S. authorities to make a voluntary disclosure regarding its U.S. cross-border business. When the Swiss Bank Program was announced later that month, the Bank was directed to participate in order to resolve any culpability or liability related to its U.S, cross-border business. facilitated the cooperation of bank employees who elected to speak with the Department of Justice concerning BSl-related matters. 4. All of the actions of the Authorized Signatories of the Company, are hereby severally ratified, confirmed, approved and adopted as actions on behalf of the Company. IN WITNESS WHEREOF, the Board of Directors of the Company has executed this Resolution. 1. Capitalized terms shall have the meaning ascribed to them in the Swiss Bank Program. This document has been published on 27May16 by the Equipo Nizkor and Derechos Human Rights. In accordance with Title 17 U.S.C. Section 107, this material is distributed without profit to those who have expressed a prior interest in receiving the included information for research and educational purposes.